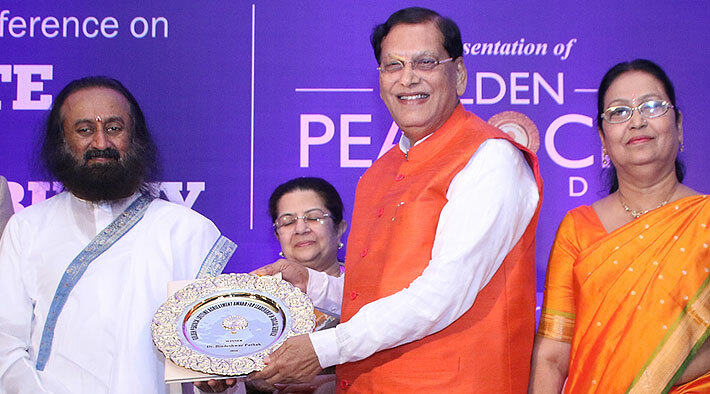 Dr. Bindeshwar Pathak, the Founder of Sulabh International is widely recognized not only in India but also abroad for dedicating his life to build a nationwide sanitation movement spanning over four decades. It has made a critical difference in the lives of millions of severely disadvantaged poor who cannot afford individual toilets, and those who worked as manual scavengers and faced untold discrimination in the society. Dr. Pathak has been inspired by Mahatma Gandhi. He is a practising Gandhian, and is intrinsically aligned with the purposes and principles of the United Nations. In the last 46 years, he has worked tirelessly for Human Rights of manual scavengers who clean dry latrines, come from the lowest stratum of India's caste-based system and are mostly women. His work aims at rehabilitating manual scavengers by providing alternative employment through skill development. Dr. Pathak believes that a social system that is not inclusive and discriminates must be changed. He runs nation-wide sanitation campaigns, highlighting the plight of manual scavengers as well as women and children. He pioneered the concept of public toilets in India in 1970. The two-pit flush toilet, that he invented has been installed in over 1.5 million households in India alone. The Government has built another 54 million toilets based on his design. It has been recognized by the UNDP as a Global Best Practice that could be an effective instrument for achieving Millennium Development Goals for providing sanitation to more than 2 billion people across the world. The BBC serial, 'Horizon' has called it one of the five unique inventions in the world that has a direct bearing on humanity. His actions have altered the process of inheriting an inhuman occupation based on caste. He has set up schools and vocational training centres that offer modern education to manual scavengers and their children. His sanitation movement is largely helping change the mindset of the society towards health, equality and dignity and rights of women. He was awarded the Padma Bhushan by the Indian government, and inducted in the United Nations Environment Programme Global 500 Roll of Honour. He was also awarded the Stockholm Water Prize and received Legend of Planet Award from French Senate in 2013. In 2015, he featured in the top 50 the Economist's Global Diversity List alongside US President Barak Obama. In 2016, he was awarded the WHO Public Health Champion Awards, the New York Global Leaders Dialogue Humanitarian Award. Today he is being awarded by IOD with Lifetime Achievement for exemplary leadership and service to the humanity. He is the real pioneer of 'Swachh Bharat' not only in India but globally.